Having cats as pets usually means porter-duty for you, the owner. 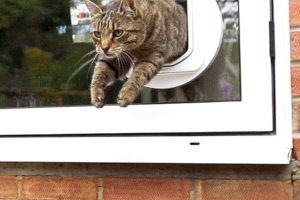 Cat flaps are a solution, but having a standard, non-automatic flap might invite intruders into your house. If this is the case, automatic cat doors are the solution to your problem. In this article, we will review, and dive into the specifics, of the Cat Mate Elite Cat Door With Timer. 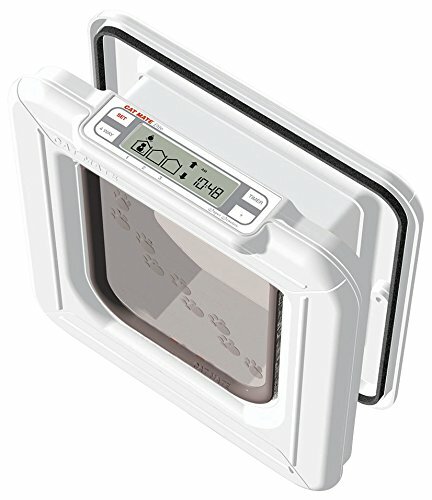 What Is The Cat Mate Elite Automatic Cat Flap With Timer? 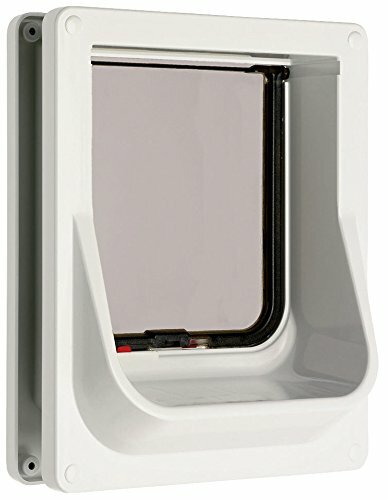 The Cat Mate Elite is an automatic cat door that makes use of RFID technology to unlock the door mechanism for the cat, so your pet can push the flap and enter or exit. RFID stands for Radio Frequency IDentification. The cat needs a pre-programmed RFID collar tag with its own personalized ID. The ID will get scanned by a control board in the electronic cat flap. The system unlocks when it recognizes the ID. It’s a safe means of access control for pet doors because only animals with a preapproved RFID collar tag can exit or enter the flap. 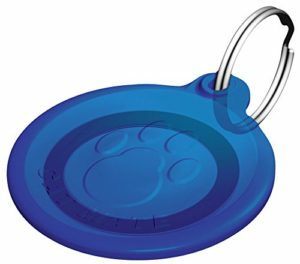 When you purchase this device, it comes with two collar ID tags for you to register. The Cat Mate can hold up to eight ID’s in it’s built in memory. It can manage the entry and exit for up to eight pets of your choice. It keeps all undesired animals out. If you currently have more than two pets, you can buy additional tags separately. Collar tags are quite affordable. The Cat Mate Elite features selective entry and exit access control. It does this using its special locking mechanism. The mechanism locks either the exit or entry, both, or neither. By utilizing the method of selective entry, you can plan individually which cat will be indoor-only and which ones of your cats will have entirely free access to the outside. The Cat Mate Elite Super Selective has a timer which enables you to program an outdoor routine for your cat. The device comes with an LCD display. The LCD screen displays the currently programmed entry and exit lock status. IT also shows you if the cat is inside or outside. It also tells you the time the door was last used by that unique ID, to up to three cats. 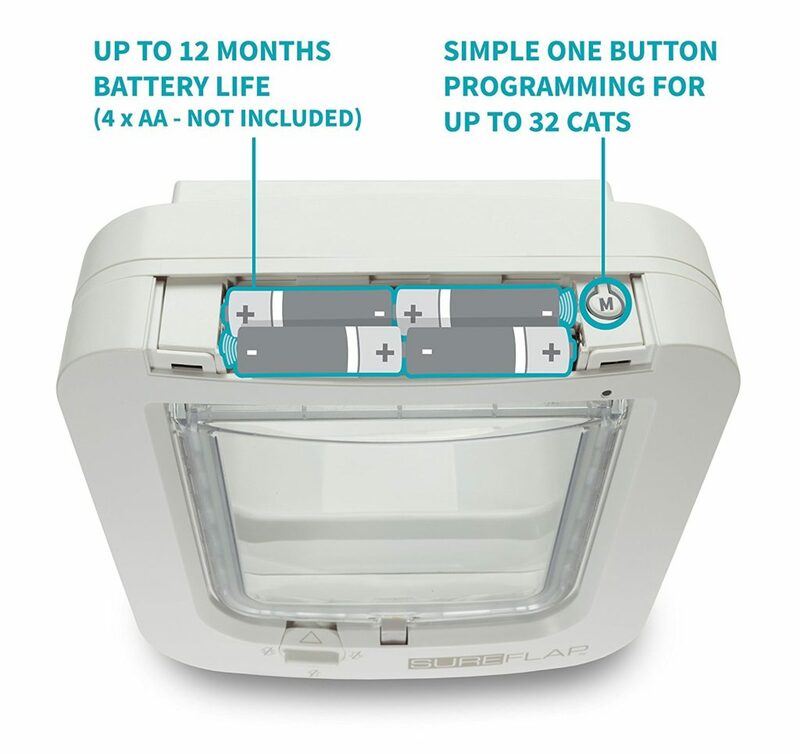 The Cat Mate Elite door operates on four AA batteries. 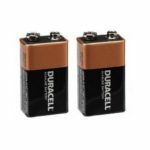 The batteries last around six to nine months, based on the usage and the quality of the batteries. Batteries are not included. 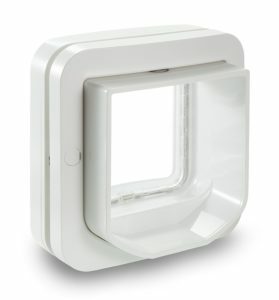 What Are The Features Of The Automatic Cat Flap? Suitable for small to medium size cats. It will keep all unwanted animals out. Only cats with the preregistered collar tags can enter/exit through the door, based on the settings you selected. Selective control: decide per cat who exits and enters. With the use of unique ID collar tags, you can control which cats will be indoor-only and which ones outside. Timed control access enables you to establish an outdoor routine for your cat. Like keeping the cats in after five pm. The LCD screen shows you the selected entry and exit lock settings, if your cats are inside or outside, and the last time the door was activated by which ID, You can look up the location of up to three cats. The Unit includes two electronic ID tags (can be set to work with up to eight unique ID’s). It is powered by four AA batteries. Frame-lining up to two (50 cm), ideal for various types of installations. Extra liners for wall installations. You can buy these separately. A weather-proof, brush sealed, flap. A rain seal to keep water out and stop it from leaking. How Does This Device Operate? The Cat Mate Elite operates through a control board, a scanner and a collar tag with a microchip. The chip acts as a key for the control board to read. When the registered unique ID, located on the cat’s collar, gets scanned and recognized by the control board, a hinge unlocks. This action allows the cat to move the door with its head, nose or perhaps paws and get through. The activation distance is a couple of inches. The disc has to be close enough to the scanner to be read. Otherwise, the tag will not get read, and therefore the mechanism will not unlock. The cat door takes approximately 1-2 seconds to open up after reading the pet’s ID. The flap needs about 2-3 seconds to fasten, depending on the settings you provided, giving the cat adequate time to go through the door. When unlocking, the mechanism makes a clicking sound. This way the cat can learn it’s OK to push the door and subsequently go through it. After the cat has cleared the door of its tail, the pet door makes a sound when locking. The locking mechanism consists of small pegs that pop up from the frame into the base of the door. This is the reason why the Cat Mate Elite Super Selective is promoted as raccoon-proof because the locking mechanism doesn’t rely on an outside control, or even a latch, that intelligent animals like raccoons or stray cats can easily manipulate. 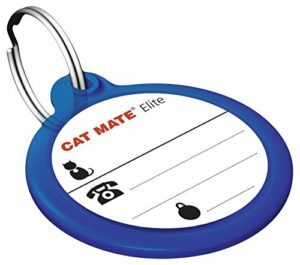 Cat Mate Elite operates through RFID collar tags. If your cat has a microchip implant, the implant will not interfere with the correct functioning of the automatic flap. In & Out: your pets using their respective collar tags have free access to exit and entry. In-Only: your pets can enter the door, but they cannot get back out. Out-Only: your pets can exit the door, but they cannot get back in. Locked: the flap is fully secured. How Does The Programmable Timer Work? The timer enables you to establish an outdoor routine for your pets. For instance, if you would like your pet to exit the door starting from nine am, and remain inside after eight pm, you can schedule this with this particular pet door. If you have a multi cat household, the timer will not have the ability to selectively determine which cat will continue to be inside or outside at predesignated times. The routine of the timer is set for all cats simultaneously. Example: all kitties will have the ability to go outdoors at ten am or even later, and they cannot leave the house to go to the great outdoors after five pm. If it happens that one of your cats didn’t get inside before the time you set, the mechanism will not have your pet locked outside. Your pets still have the ability to get in after the programmed time. They just can’t go back out. For starters, the cat has to nudge the door with its nose, head or paws. Now the sensor begins searching for the RFID tag. After the sensor registers the unique RFID code and recognizes it, the flap unlocks. The locking pegs disengage, producing a bit of a clicking sound. The cat must identify this sound, so it knows it can get through, push the flap and then walk through. If the cat hesitates and remains at the same location, not entering the door, the device will lock once again. Generally speaking, cats adapt very quickly to this particular pet door. Sometimes, they just need a bit of the right training. Cat owners need the persistence to train the cat, as well as to hold out on relying on the cat to use it, until the cat feels self-assured enough to use it. This may take anywhere from a few days to a few weeks, up to even a month, based on your feline. Ultimately, all cats will want to use the door if they know adventure or food is waiting for them on the other side of the door. The Cat Mate Elite Super Selective features a training mode setting which enables the cat exiting and entering the door without needing to make use of microchip or even watching for the press noise to push. With the training mode, the door is similar to a non- automatic pet door. This tip holds true for cats that have previously used a non-automatic pet door, and they already understand how to push the flap to get in or out. The most important thing to do is to ensure that your cat will not hear the unlocking sound the very first time while pressing the door with its nose or head, trying to get in. This may scare your cat to never wanting to use it again. To prevent this from happening, you could trigger the locking system intentionally a few times while your cat is feeling secure somewhere in your home. Ultimately, your feline friend will come to investigate the strange new thing in the house. This encounter already is special. Your cat will get used to this particular noise, and he or she will realize it’s not a threat. It is certainly possible to reward your cat’s courageousness with treats in the progression. When your cat becomes used to this particular noise, he or perhaps she can begin making use of the door with the RFID tag mechanism. If your cat has never made use of a cat door, the owner’s manual has instructions and tips on the best way to train your cat to use an automatic cat door. The standard set up doesn’t take more than thirty minutes. Nearly all of this time you will spend measuring the installation site and the automatic pet flap. When you’ve cut the hole, it’ll be just a question of drilling two holes on both sides and subsequently screw the two halves of the automatic pet flap tight together. It’s an excellent idea to find out where exactly to set up the pet door: the RFID microchip tag has to be at a certain level to be read by the scanner of the door. In case you mount the door too high, or perhaps too low, the microchip may not scan correctly. However, the directions in the manual are very clear and easy to understand. If you stick to them, you shouldn’t have any trouble. Setting up the automatic cat door in flat wooden doors is actually the easiest. After making sure of the correct measurements, draw the soon-to-be hole on the door. Then cut out the hole. Drill 2 holes, one on each side, and screw the 2 halves of the Cat Mate Elite together. Installation in metal doors takes a bit longer. When installing the unit in a metal door, the door may not touch the metal directly. Touching metal will hinder the RFID signal. Generally speaking, it’s not advised to set up the cat door in glass panels. They might have way too much condensation. We suggest you to invest in a glazier to cut holes in any glass objects. Then follow very carefully, the directions to set up the cat door. 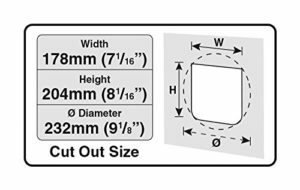 It’s not easy to cut a gap in a double glass; you might have to get a brand new glass with the hole pre-cut in it. When you prefer a simpler installation, you may want to change the glass board for Plexiglass and proceed as the standard installation. You probably need wall liners to set up the door in a wall. If a wall is quite thick, liners could be added in accordance with the Elite range. A liner’s depth measures 1.96 (50mm). When you do not have any issues with unwanted animals entering your house; you just need a timed pet door. Perhaps you simply do not wish to open the door every morning to allow your feline to go out, nor would you like to have to search for your feline buddy at night-time to keep him or her safely indoors at night. Since the pet door doesn’t lock while in training mode, you might want to tape the RFID microchip to the interior of the cat door. By doing this, with the correct settings, the door will invariably open. The chip is right there to be scanned by the scanner. Your cat will not have to utilize a collar tag, and with the timer, it’ll be locked in at night, and your pet will have the freedom to get out in the early morning, without the need of your in-person intervention. The sole concern of setting up the cat door this means it’s the excess use of batteries, but it’ll be the price to pay to stop you from having doorman duty. What Are The Advantages and Disadvantages Of The Cat Mate Elite Cat Door? Selective exit and entry management, you’ll be able to determine which cat will be indoor-only and which ones can swing both ways. The LCD shows you the general location of your pets., which cat is in- and which one is outside. It also tells you the last time the door was used. The Catmate has a timer that enables you to establish an outdoor schedule for your kitties. Features an internal locking system that cannot be manipulated by animals from the outside. Helps to stop raccoons from entering your domicile. The length of time to secure the lock may be modified to your cats’ needs. It will provide your pet with adequate time to clear the automatic flap of its tail. It flaps a lot quieter than many other cat doors brands. It has battery life indicator. It may be put in training mode for your cat to get used, without it needing to use a microchip. If used in combination with a feeding station, you can check out if your cat has consumed. It does not leak much air in comparison to several other cat doors on the industry, keeping out the cold draft. Sturdy and well thought out design. Excellent for medium and small sized cats. Programming does not feel straight forward. You might need to read the manual. The device doesn’t appear to work very well when installed in solid metal doors? The microchip RFID tags are actually a bit big for cats, but they’re not heavy. The door makes a clicking noise when unlocking, similar to the noise level of an old deadbolt lock. It may scare your cat if not used to this sound. Tags don’t have a discount if you buy multiple at once. (a Con if your cat keeps losing its tag). The tag has to be close to the panel and facing it, to get scanned. The Door opening might not be appropriate for big or overweight cats. The timer doesn’t work separately for each ID; it works for every IDs simultaneously. Example: all cats reside in daily from six pm onwards). Occasionally the door locks erroneously, leaving the door stuck. However, this doesn’t often happen, and when it does, it is often only when cats take too long to go through the door. A bit tricky to put batteries into the compartment (you only need to do this every six weeks or so, so it might not be a huge deal. Screws aren’t that high quality. Make the flap opaque, by duct taping it or painting it. It will discourage raccoons or perhaps other cats from snooping inside, which gets them much more inspired to get in. If the door got locked with the pegs out, the very best way to reset the product is by using the training mode setting. Push the system and 4-Way button together for five seconds. The program switch is placed under the battery cover. This resetting retracts the pegs, and the door can swing back to original position. After that, you’ve to press the very same buttons once again to reset the door to its programmed setting. This way, you do not have to reprogram the ID’s. If your cat has pulled open a previous cat door with its paws, it’s a wise idea to secure the door manually, at night-time. The Cat Mate Elite is an outstanding automatic cat door, which works as advertised. We think this device is a better choice than its electromagnetic version. The Cat Mate Elite’s ability to selectively recognize which cat can exit and/or enter, and the timer which enables you to establish a cycle for your cat or even cats, makes this particular device a remarkably good option for cat owners with more than one feline friend cat, and need all these functions. The door only works with collar tags and not with implanted microchips. If your cat is a rowdy fighter or exceptionally adventurous and prone to lose its collar, you might want to rethink if it’s a good idea to have your cat wearing a collar with an attached door tag. The device may not work well with indecisive cats; cats that are constantly thinking which step to take next. The door has a specific time frame for the cat to be fully inside. If your cat is slow, it’s tail might stop the flap from locking correctly. Lastly, the cat door is promoted as raccoon-proof because it cannot be manipulated externally to unlock it. However, there’s not a single cat door on the market which will not falter if an exceptionally powerful or large raccoon smashes the door over and over again, trying to break the flap mechanism. Exceptions will always exist, but for regular raccoons, the product works as advertised. If you own a number of cats and one or more of them are (temporary) indoor-only. A cat who does not like wearing collars, and sheds them easily. We advise you to do a test run you cat for a week with a wearing a collar before you invest in this door. To be installed in metal doors or walls. Most of the questions a cat behavior therapist gets are about incontinence and spraying. That isn’t so surprising: it is the most common behavioral problem in cats and also, it is a predicament that most owners would like to get fixed ASAP. What To Do If My Cat Keeps Pooping Or Peeing Outside The Litter Box? Questions about stopping cats from peeing or pooping outside the litter box are often difficult to answer. There can be so many different causes why a cat is showing incontinence or spraying. Keep in mind, the marking of specific places with urine and stools is, in fact, a part of normal cat behavior. Which cat has marked the location. The emotional/hormonal status of the feline who has marked. Where the boundaries of the cat’s territory lie. Marking is not only done by urine and stool, but also by scratching objects (visual marking) and giving headbutts to objects (scent marking). Our cats have glands on the sides of their heads and under the legs. These glands release so-called pheromones in places where they scratch and rub. The cat displays natural cat toilet behavior, except for the location: outside the litter box. If the cat shows an unnatural positioning of the body or loud meowing, consult a vet. The cat then seeks an alternative place because the cat does not want or dare to use the cat litter box or place where the cat litter station is placed. Or maybe because the cat finds another area to be more attractive to go to the bathroom in. Once a cat has used the toilet several times in a particular location, this gives him a feeling of learned behavior. Pain in excreting on the cat litter box, for example, due to urinary tract problems. Your cat does not like the grit in the box. The litter box is not clean enough. The cat litter box is too small. Your cat wants more privacy. It would rather have a cap on the litter box. The scent of other cats in the cat litter. Prevent from other cats that the cat uses the cat litter. Being a victim of the behavior of other cats. Being a victim of the behavior of other animals or people. Fear of other objects near the litter box. Further away from other cats. Further away from other things that make the cat anxious. Cats can develop a preference for a particular substrate. If this is the case, it is most likely for soft surfaces, such as towels, pillows, etc. 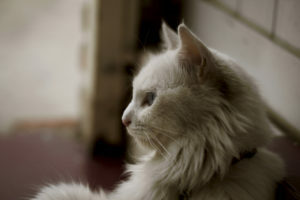 These preferences can spontaneously develop in cats, but there is often a connection with a dislike of the cat litter box, or the location of the litter box. The cat will then develop a new preference for a spot to pee and defecate in if the cat feels that this place is better suited for him. Kittens who can not reach the cat litter in time and find soft pillows on their way. Cats and kittens who, if they are just new at home, can not find the cat litter. Unneutered tomcats spray the most on average. Castration is, therefore, no guarantee of ending spraying behavior. Spraying is recognizable by the cat’s position. The cat is upright, peeing a small amount of urine straight from the back. The cat flutters its tail frequently during spraying. A cat can mark by spraying while standing up, but also, a cat can also mark while seated in the normal excretion position. This marking can be done both with urine and feces. Cats exhibit these behaviors for the same reasons as spraying. Spraying (and marking) at home is behavior that shows cats especially when they are feeling insecure about their territory. Problems between cats in the house. Too many cats at home (spraying occurs more often in households with multiple cats. The more cats in the house, the greater the chance of spraying). Strange new scents in the home. Change of family composition (new pets or family members). A change in routine of the owner. The way the owner interacts with the cat. If the cat is intentionally spraying while in sight of the owner while looking at the owner while performing the act, there is almost always a frustration in the cat that is related to the behavior of the master concerning the cat. Cross out a possible medical cause first. Think of urine examination and possibly additional research by the vet. If there is no medical cause, try to figure out what other possible cause of litter box failure there might be. Maybe your cat prefers another location, or just dislikes the litter box itself? Place sufficient cat litter boxes throughout the house (equal to the number of cats +1). Use cat litter stations that are large enough (1 ½ times the length of the cat). Make the cat litter box as attractive as possible by using a grit that your cat loves. Provide sufficient personal space your kitties in multiple cat households. Clean the contaminated sites thoroughly with a special detergent that is suitable for removing cat urine / feces. Rinse the contaminated areas after cleaning, by rinsing it with plenty of fresh water. If necessary, use a special spray that changes the odor molecules on the excretion site, so that these places lose their smell. Make sure that the spray itself does not contain any other fragrances. Make the excretion spots temporarily unreachable and put (if possible) a litter box on or near this place. If the cat is urine spraying, try to figure out what is the reason for this and try to remove or fix the reason. If you think stress or feelings of insecurity play a role, you can buy a pheromone vaporizer. But do not forget to fix the real cause, instead of using a band-aid solution to mask the symptoms. Apply strong odors to the excretion site or clean the location with strong smelling detergent. The cat will perceive this as a mark placed over his own. Your pet will likely put his scent back on that same marking location as soon as possible. Put the cat on the cat litter and hold it. there This action causes the cat to start disliking the cat litter box. Punish your cat. In practice, the punishment is always late and is not understood by the cat. The punishment causes the cat to feel insecure or frustrated, and consequently, it will display even more problematic behavior! Drug your cat with medications such as sedatives, hormone injections or antidepressants, without treating the cause of the toilet issues. The chance of success with the sole use of medicine without adaptation to the cat’s environment is small. In the meantime, you will only spend a lot of money. The cause of the bathroom problems will only get more and more tricky to fix, as time goes by. Cats not using the litter box and spraying in your home can be remedied, if you can find the cause and treat it or remove it. In addition to tackling the cause, it is important that the cat learns to use his designated toilet and the associated behavior again. Your cat will never spray or excrete in your house to harass you. Your pet always has a good reason for showing this behavior. If a medical cause is excluded by the vet, and you can not solve the problem yourself, a cat behavior therapist might be able to help you. He or she can then help you find the cause, and help you train your pet to only use the litter box. 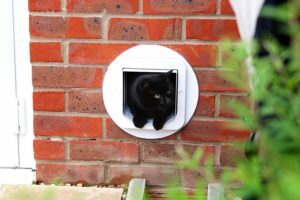 What is the Cat Mate Electromagnetic Cat Flap? The Cat Mate Electromagnetic Flap is an automatic cat door that provides your pet the choice to exit and type in the home as many times he/she wants, enjoying your backyard and relieving you from full-time doorman duty. The Cat Mate electronic pet door gives a safe way of letting your cats roam free because it identifies your cat through sophisticated electromagnetic technology. It also enables your cats to get into your dwelling without allowing stray cats, raccoons or other animals to enter your house. The door recognizes your cat by utilizing a small magnet. The magnet also works as an identification tag, attached to your pet’s collar. A sensitive circuit centrally located on the control board, senses if the magnet tag is near and if it is, it allows your pet to get through the flap. Frame lining to two 3/8 (60mm). Makes it ideal for all doors. The control panel uses one 9-volt battery, which is not included. The Cat Mate Electromagnetic cat door comes with two small magnets that can be attached to your cat’s collar, much like a title tag. What Are the Features of This Device? Includes two small magnets for your pets to wear. It opens only to the pet that is equipped with the magnet. Keeps all other unwanted animals out. Flap with brush: weather-proof seal, reducing warmth loss, draft coming in, and makes for quieter flapping. What are the Dimensions and Technical Requirements? Yes. one PP3 9v. alkaline battery. Batteries last approx. twelve months. 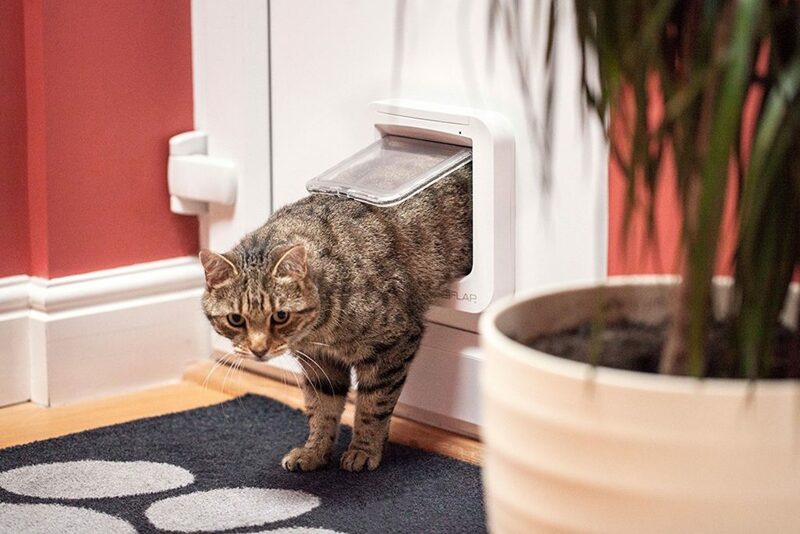 The Cat Mate cat door detects the area of a great compact magnet the cat uses in its collar and unlocks a latch that enables the cat to get into the home from the outside by pressing the door with its nose or perhaps head to get in. After the cat gets inside, the door returns to its usual place to get locked. The locking system prevents the door from swinging into the home, but not from swinging outwards. The cat using the magnet on its collar can exit and type in the cat door. The cat just needs to use the magnet when entering the door but not when getting out. Useful setting in case you would like to keep your cat inside at night. The locking has to be done manually when your cat is inside. This feature enables you to keep your cat outside. The pet door is fully locked. Is This Cat Door Easy To Install? Can You DIY or Should You Hire Someone? The Electromagnetic Cat Mate door is pretty simple to set up. You’ll need a jigsaw, a drill, and a screwdriver. In the item description, you read about the lining. A liner is a frame that is set up through the door, to cover up the interior of the door. Self-lining ways that you do not have to construct the frame for the cat flap if used in door or perhaps panels. How to install the Cat Mate Electromagnetic in plastic panels and wooden doors. These directions are for basic guidance only. You’ll see a far more detailed information and more tips on various types of installations in the instruction booklet. Place the template in the position you would like the cat door. The bottom part of the gap has to be the same height than your cat’s lower stomach. Draw the cat flap’s hole around completely. Before cutting the hole, drill two holes of approximately 1/4 (6mm) diameter in both of the most suited corners. Cut the hole along the interior of the drawn line using an (electric) jig-saw. Determine the thickness of the panel in your door, and use the right screws. Screw it tight, attaching both parts of the cat door. Advantages and Disadvantages The Cat Mate Electromagnetic Cat Flap? Simple directions and easy installation. Large size, it allows cats up to thirteen lbs to pass though. The collar magnets are generic magnets. You have a wide selection of buying options to get yourself some back up collars. The magnets just have to be strong enough. Feral and neighborhoods cats can not use the cat door, provided they don’t have a magnet on their collars. Flap with brush weather-proof seal. Low-noise: Not a loud sound when unlocking the flap. Battery lasts longest compared to all other automatic cat doors. Recommended for keeping indoor spaces separate. Any cat with a magnet can use the cat door; magnets can’t be programmed to specific pets. The locking mechanism cannot be offset automatically. You have to tape the latch down to train your cat in the beginning. The cat door only locks when swinging in, but not when rocking outwards. An intelligent cat or raccoon can certainly pull the flap open and enter through the door. This occurs only rarely, with extraordinarily intelligent cats and like-minded raccoons. The magnet on the collar can attract other metal objects. The magnets might limit your cat. No more bells in cat toys, or metal tag names. It usually requires the magnet to be at a particular level to do the job (margin of error is approximately 0.39″ or one cm), but this may be modified with the placement on the cat’s collar. The cat flap makes a clicking noise when it unlocks. It’s not obnoxious, but it might affect scaredy cats. The door sometimes fails to lock when swinging back into the original position. The majority of the time, it does lock, but not 100 % of the time. Faulty locking can be due to the wind or a tail trapped in the door, etc. The brush strip on the flap gets dirty with cat hair. You need to clean it occasionally. Before you buy it, think about the size of your cats. Make sure they will fit through the cat door effortlessly. In the beginning, it might be a good idea to tape the door wide open, and place the magnet on your cat’s collar. This way you can get your kitty used to the clicking noise, without any locking mechanism in place. Your cat can take it’s time without feeling rushed. To keep from having excess cat hair in the brush strip, clean the door from time to time. If the cat door opens in a half-open position, check out the holes on top sides of the cat door. It probably means they have not been drilled deep enough. thus stopping the hinge from moving freely. The Cat Mate Electromagnetic cat door works to prevent stray animals from entering the home, and it’s suitable to be used inside too. However, the flap may be pulled outwards. That might be a flaw with really brazen wild animals and raccoons. In the event that you have to have a little-added protection against neighborhood pets or even to other animals inside your home, this is a great alternative for you. If unwanted animals or perhaps other animals outside are remarkably intelligent, powerful and stubborn, this may not work for you. The Cat Mate Electromagnetic pet door is the very best of this particular kind in this price range, despite the less favorable facts that the points above mentioned. If you would like a reliable, limited entry system that is 100 % animal-proof, perhaps it’d be a better strategy to get a higher-tech product that has a locking setting in both sides of the flap. To households with small to above-average sized cats. To keep your neighbor’s cat or not so intelligent raccoons out. To stop extra aggressive or intelligent pets or raccoons. Hopefully, no one deliberately makes life difficult for their cat. But not all that stresses out cats is directly apparent. Certainly, for the caring cat guardian that wants their furry friend to live the very best life possible, it is a good idea to learn what NOT to do. So you can keep your cat free from accidental stress. Several points in this article tend to be more logical compared to others, but here are ten things to not do to your cat. These things make them to be unhappy, leads to unnecessary discomfort, and makes life more challenging for you. This list is not an extensive nor definitive list, and in case you have some tips for us, then please share them by making a comment. Your cat jumps on the dining table, and you yell at him or her. Oh no! What you did was show the cat to not jump on the countertop when you are there. She is still every bit as prone to pop up when you are at work. Punishment is linked by cats to the person, instead of to the action, so there is a good possibility of damaging the bond between guardian and cat without actually solving the issue. And even worse, yelling at the cat is an extraordinary source of anxiety. And remember what good cats do when they are stressed? Pee in the wrong places! No great. Rather, begin using additional ways to avoid these behaviors, and in case it is crucial to punish, like for the cat’s safety, use an Act of God.. like a stacked up tin cans which will tumble down once the cat jumps on the countertop. In case you’re running a multi-cat household, do not count on them to talk about litter boxes. Cats are extremely personal about their toileting. A few felines even demand a special tray for their solid and fluid excretions. Sharing a litter box with another cat suggests compromising on territorial markers. For instance, scent, and also for although majority chilled cats what this means is pressure. Additionally, keep the trays clean. No pet wants to use a dirty toilet, especially a sanitary animal like a cat. The effect might be a cat which poops outside of the box as a dirty protest. 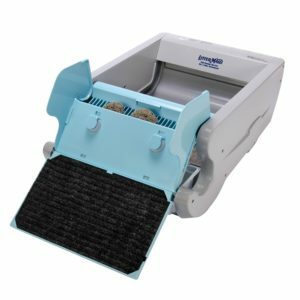 If your routine makes it difficult to poop scoop and renew the litter a couple of times one day, then check out an automatic, self-cleaning litter tray. Cats require lots of mental stimulation, and especially for an inside cat, it is up you to offer your pet some. Just because cats love to sleep, does not mean they do not wish to be amused. Think about them like sprinters, who like short spurts of activity followed by recovery and rest. Try getting in the practice of playing with your cat for a couple of minutes, two or maybe three times one day. Offer locations just where they’ll perch, like a taller cat tower to find a window and observe the world go by. Leave the television running while you are away, tuned to a wildlife channel. Offer them cat toys, particularly those with catnip, and spin them round, so there is something new and fascinating to get kitty’s interest. Many cases of aggression in the cat would be the outcome of the cat feeling nervous, stressed, and trapped. Cats wish to stay away from conflict, but when backed into an area with zero escape routes, they’re likely to feel frightened, and they might lash out to defend themselves. Understand this simple truth about cat psychology. Move out of a possible escape path for your cat. This way your kitty won’t feel so frightened. Carrying a lot of weight shortens your cat’s life significantly. There is a powerful link between diabetes and obesity in cats. And more: complications such as joint disease, liver problems, and heart problems. Do not overfeed your cat, and try using activities to keep your cat in shape. Puzzle feeders or treat dispenser that require some effort from your pet help to get them moving about. These toy treat dispenser also offer emotional stimulation. The unpleasant smell of male cat urine, and also their increased chance of spraying to mark their territory, is included by some other factors to act. It preserves the women the strain of coming into heat every three days, and also the danger associated with a severe womb infection, known as a pyometra, is eliminated by it. Declawing involves amputating the upper part of every toe. Check out your fingers now. Imagine how troublesome and painful life would be if you had the end of every finger, from the top joint, amputated. Please, do not declaw your cat. In case your cat gives you clawing and scratching issues in your home, then tackle it by some other means. This includes offering a lot of emotional stimulation and also providing the cat with a lot of opportunities to scratch. To do this, determine in case you cat likes to scratch vertical or horizontal surfaces. Maybe you cat likes scratch posts with both the orientations. Make certain the scratch objects are sturdy and tall. Make sure the cat can reach up far enough, and subsequently rake down. Provide a few of these scratch opportunities, and place them at key locations like exits and entrances, and alongside the cat’s napping spots. Exactly when is the last time you looked at your cat’s teeth? Dental diseases are frighteningly common, starting as early as from two, three years of age. By ignoring tooth health, you jeopardize the cat. This might lead them to require surgery later in life, when their aging body is less able to manage the stress. Rather, begin brushing your cat’s teeth. Or maybe consider alternatives, like food or water additives, dental hygiene diet programs, or even chew toys with a beneficial cleaning action. Should your cat become ill, steer away from obtaining treatments for your cat according to what you can afford. Instead, focus on what is ideal for your beloved pet. When that kitty of yours is insured, you’re free from the boundaries of what you have in your bank account. And you are also able to choose a therapy based on an expert’s recommendation. Cancer is, unfortunately, a very common disease in cats and dogs. Cancer treatment is incredibly expensive. My friend has spent 15.000 USD on chemotherapy for her cat Hunter, and she wishes she got pet insurance retrospectively. Don’t let it happen to you. Great, your cat remains strictly indoors, so why does she require a chip? To respond to this, imagine it is a cool, wet winter ‘s night. While you take the food in from the automobile, the cat slips from the home and into the darkness. Since she has never been outdoors before, she’s no concept of exactly where she is. Any possibility of retracing the fragrance on her paws is flushed out by the rain. This cat will become lost. Now think she has been picked up and delivered to a shelter. She doesn’t have a microchip. No-one knows if this cat has an owner, so how can they find you?. Nevertheless, with a chip, it is a simple matter to scan your pet, search for the right person inside the register, and have the shelter provide you with a phone call. And so there we have it, ten tips of things not to do to your cat. Both you and your cat now have a chance of living in perfect harmony for years to come. Do you have any suggestions on what tips to include? Remember to leave a comment! An automatic cat door is a great way of keeping unwanted visitors out, and your beloved pets inside your house. Or outside. 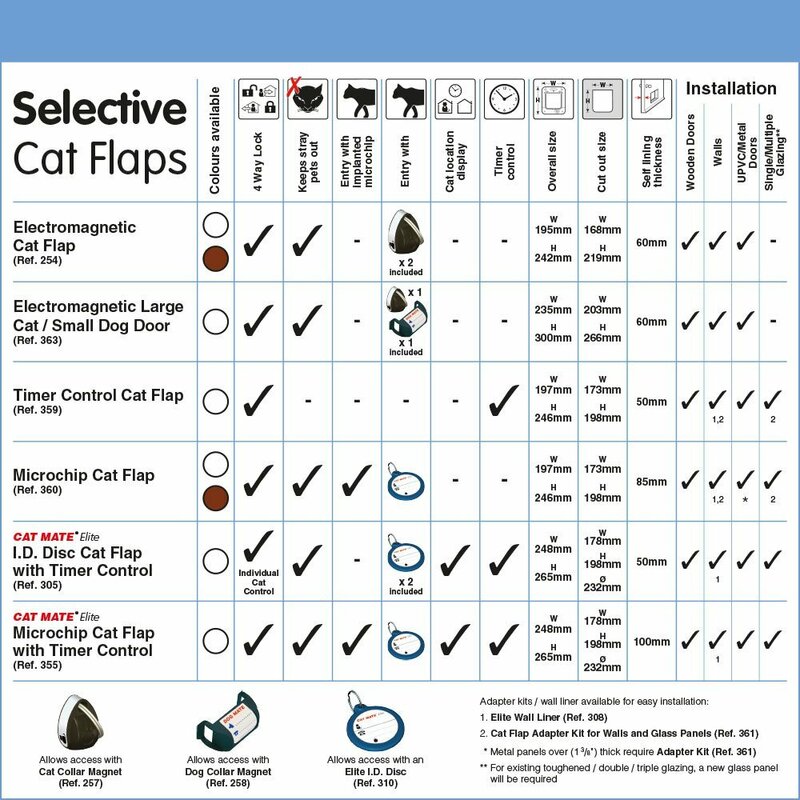 Electronic cat flaps are programmable in any setting you might need. In this article, we dive into the specifics of the SureFlap Microchip for Cats. 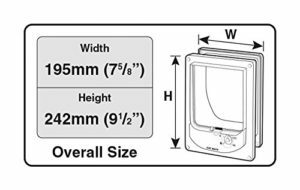 What is the Sureflap Microchap Cat Door? 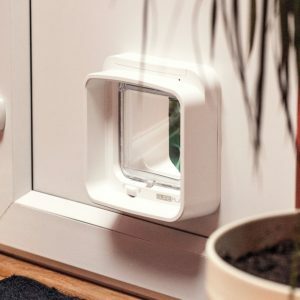 The SureFlap Microchip Cat Door is an automatic door for cats that employs a microchip implanted in the cat’s skin as a key. The door only unlocks when your microchipped cat tries to enter your house. Without a chip, intruders such as raccoons, the neighborhood cats, etc. are unable to enter your house through your cat flap. This cat door has a strong central magnet, to keep the door from swinging in the wind, and to add more security and sealing power. This particular system doesn’t require the cat to wear a collar with a tag to work, making it extra advantageous if your kitty does not like to wear collars.. or if your cat already lost several of them. Some people do not like the thought of their cat getting microchipped. 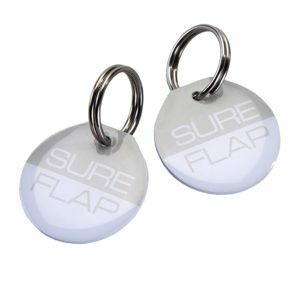 If you are one of them, SureFlap offers tags you can attach to your cat’s collar. You can buy these tags separately. The system is suitable for single and large multi-cat households. You can program up to 32 unique cat ID’s in its memory. Collar Tags with MicroChip. See More Information On Amazon. 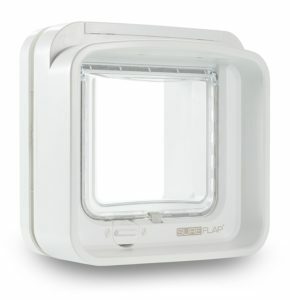 The system of the SureFlap utilizes the principle of “selective entry,” which means it keeps undesired felines and other creatures from entering your home, but any pet can leave, regardless of wether they have a microchip implanted. The cat flap features a 4-way manual locking setting that enables you to lock it with any combination of in/out your heart desires. If your cat suffers bullying from a mean neighborhood cat or raccoons, or the other little critters come in to steal your cat;s food, the SureFlap is a great solution to put an end to all these unwanted behaviors. 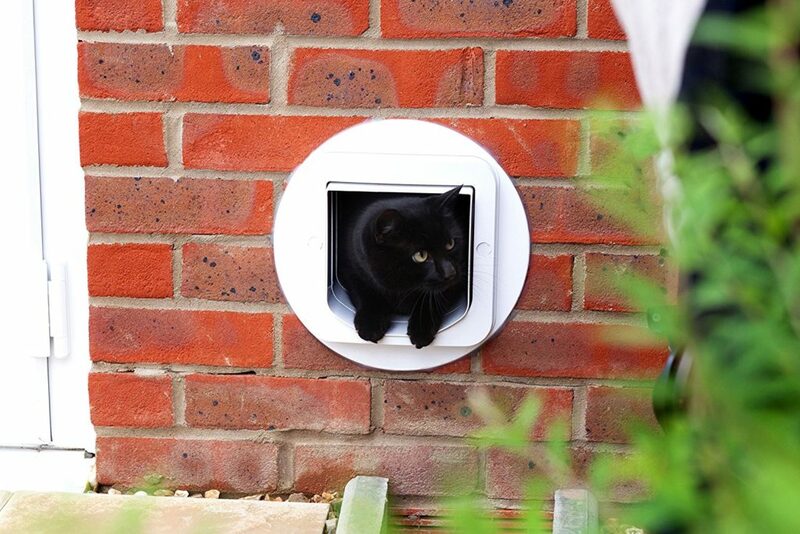 The SureFlap cat door is suitable for small and medium sized cats. The flap most likely works with your cat’s existing microchip. It is compatible with 9, 10 and 15 digit microchips. The only exclusions are 10-digit microchips, with codes beginning with 000, 010 and 020. You can program up to 32 microchips ids in the device’s memory. No collar or tag required. Collars and tags can get lost or stolen. It runs on 4AA batteries (not included). Batteries last from 6-12 months with one cat, depending on the usage frequency. It has a light to indicate a low battery. Selective entry – any cat can exit (with or without microchip). It registers your cat’s microchip by pushing one button. Sturdy and well-designed two-part device that you can install with ease in walls, doors, and windows. This door fits into the gap left by most of the previous existing cat doors. It also works with collar tags, available for purchase separately. The magnet in the center prevents the door from flapping in the wind. The tunnel design keeps intruder cats from pulling the door inwards. (This dimension is the narrowest section of the cat flap that your kitty will have to enter). (The amount of space needed to fit your cat door. The Installation Template can be used to cut the hole). 10-digit microchips (FDXA, frequently used in the USA). With exception of the 10-digit microchips of those starting with 000, 010 and 020. If you don’t remember your cat’s microchip number, do not despair. If your cat has been previously microchipped in the past and you don’t remember the code number, you don’t need to remember it to program the door. Your cat’s microchip will be registered it in the SureFlap’s memory. 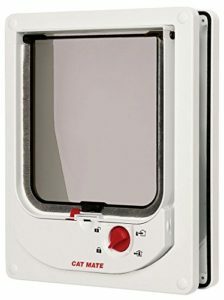 If you already have your cat microchipped with an incompatible microchip code, you might want to look into the newer and larger version: The SureFlap Microchip Pet Door. This door is suitable for larger cats and small pooches, and is compatible with all microchips – without exception. If you haven’t previously microchipped your cat: We advise you to pass the microchip through the pet flap before you have the chip implanted in your cat’s skin. By the time your cat gets micro-chipped, you can be sure the chip is in working order and is already programmed in the entrance’s memory. But if you do not like the idea of getting your kitty microchip implants, you can buy the optional RFID collar tag(s). How Does This Unit Operate? When the pre-approved microchipped cat comes close to the door and is about to enter it, a scanner placed in the tunnel scans the microchip, recognizes the ID and automatically unfastens a latch. This automatic action allows the kitty to push the door open with its head or nose, and subsequently enter your house. 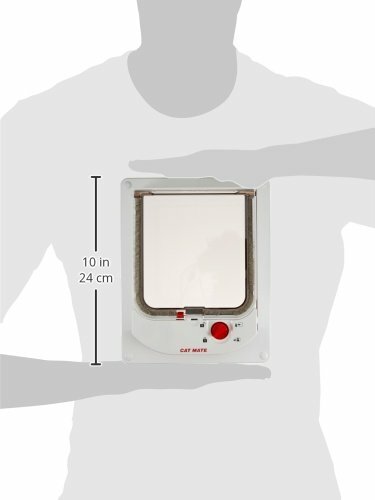 The SureFlap microchip works with passive RFID technology. RFID is short for Radio Frequency Identification. RFID makes sure the chip implanted in your cats’ skin does not trigger the locking mechanism to open. Rather, the microchip contains information waiting to be scanned and subsequently recognized by the scanner situated in the pet door’s frame. When your cat approaches the flap, first the motion sensor turns on and then activates the Radio Frequency scanner sensor to read the information on the microchip. Once the memory in the cat entrance identifies the chip ID, the system electronically opens the latch for your pet to push the door to get in. After your cat enters the door, it shuts automatically by way of a strong magnet. You can set the door with different lengths of time to close. Different closing times are especially useful when getting cats accustomed to automatic cat doors. Cats need to get used to the “click” sound when the scanner reads the microchip, allowing them to get through. When training your felines to use the SureFlap, we advise you to set the closing speed to the slowest setting. The fastest setting for the flap to fasten after your pet has passed through is approximately 2 seconds. How does the 4-way locking system work? Your cats can come indoors and go outdoors as they please. The SureFlap features the principle of selective entry. With selective entry, only micro chipped cats can enter the door, but any pet with or without microchip can leave. Your cats can only get in, but they can’t get out. You can enable this option by manually turning a dial from the inside. This action locks the latch and keeps your cats in the house. If one or more of your pets are outside and they are equipped with a microchip, your pet will be able to enter your home, but none of your pets can go outdoors. 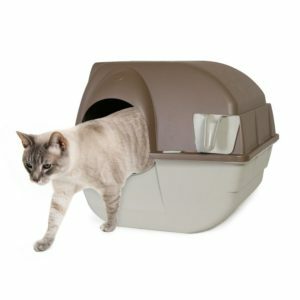 This option is useful to keep your cats in at night or to get them ready for veterinarian visits. Any pet can exit the door, but none can get back in. You can manually set this option by turning a dial located on the flap. This feature could be useful if you want to keep your cat outdoors when allergic visitors come over, the house cleaners do their job, or whatever reasons you might have to (temporary) keep your pets outside. The flap is shut tight. With this setting, no pet can enter or exit through the door. The setting as mentioned earlier is also helpful to keep your cats inside at night if you think your pet could outsmart the “Only In” mechanism. You also use Locked mode when you’re leaving on a trip with your cats. It is important to mention that SureFlap cat door does not prevent cats without microchip from exiting the door. 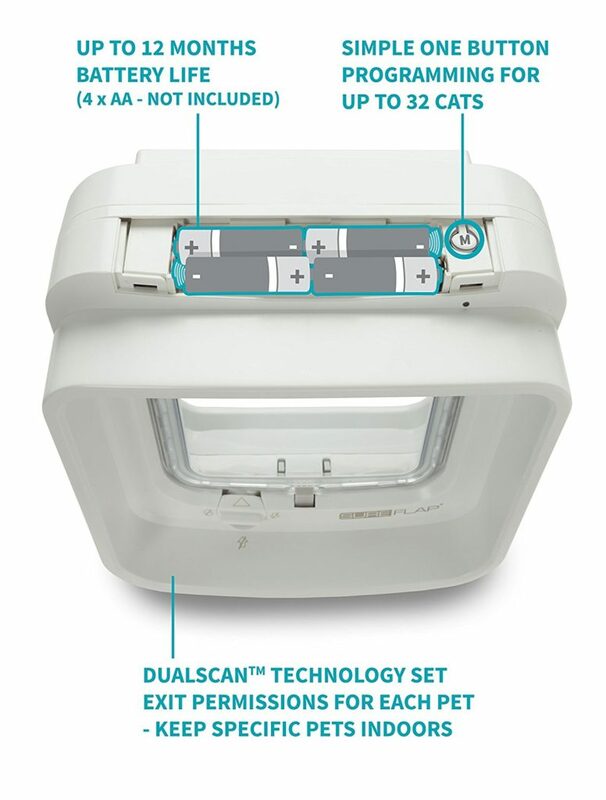 If you run a multiple cat household and you want to control which cat can enter and leave through the door, it is a better idea to get the SureFlap DualScan. The 4-Way locking is not automatic or controlled by a timer. If you want your cat to be inside at specific times, you will need to set it by hand by shifting a control on the flap. 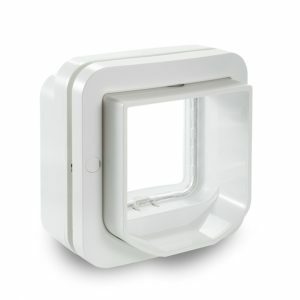 The newer version of the SureFlap Microchip Pet Door, designed for larger cats or small dogs, does come with a timer. You can set the timer change the door’s locking settings automatically at pre-programmed times. how many unwanted “visitors” approach the cat flap during the day/night. The company advises not to use rechargeable batteries because their performance is not 100% reliable. If you do decide to use rechargeable batteries, make sure to change them well before they run out. If the batteries run out while you aren’t around, the entrance gets locked by default. Batteries going flat may leave your cat locked out or locked in. To help you avoid this terrible disaster, the SureFlap cat door has a battery life indicator, which is a small red led (on top of the door) that blinks when the batteries are about to run out. Do make sure to check on the battery life indicator often. How To Install This System? The SureFlap microchip cat door consists of two parts that are being held together by screws. The depth of this tunnel is created with the two parts, and it’s adjustable. It is wholly adaptable to your doors’ measurement. The installation of the SureFlap in wooden doors does not have the need for any adapters. You can install it by following the instructions on the YouTube video. To install the SureFlap in metal doors, you will need an adapter. The reason is that metal could interfere with the Radio Frequencies, thus stopping the scanner from scanning the microchip. The adapter is especially a must when the metal has any steel components. The SureFlap works exceptionally well on garage doors. The design of the SureFlap permits for a much tighter fit on thin metal garage doors than most other cat doors. When installing the door in glass windows, an adapter is required. This adapter is circular with 11″ diameter. It is an excellent idea to let a glazier (glass professional) cut the opening for, instead of you or your handyman hubby. One or possibly more SureFlap Tunnel Extenders may be required for wall installations, depending on the thickness of the wall. 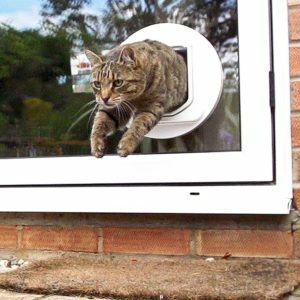 The original SureFlap Microchip cat door, without any Tunnel Extenders, can handle up to 2 inches in depth. 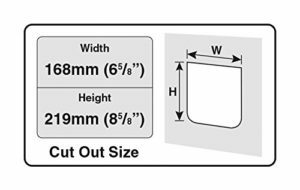 If you want to install the SureFlap onto a pre-existing opening, you will likely have a little bit of extra space on the width and height of the opening. 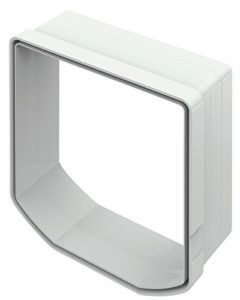 You can use the “Cat Flap Mounting Adapter” to cover up the larger hole, without making the design look ugly. Easy to register the chip. Simply push the button and let the chip or cat with the chip implant pass through. Only the registered cats can enter the door with their unique microchip ID. No chance of other creatures wearing magnets or IR tags entering the door, unlike other types cat doors might. Your cats do not need to wear a collar tag. But if you want, this device can work with collar tags. A clicking noise to act as a hindrance for wild animals following your pet. The long life of included batteries. Strong magnet keeps the flap from blowing open by wind gusts. Selective entry means the door locks only in inwards direction, so it can be pulled open from the outside. Cheeky raccoons can open the door by pulling it open, especially on the setting that allows cats to leave and enter freely. The opening is on the small side. It is more fitting for small to medium sized felines and less for big cats (euphemism for overweight) or tall cats (4.72″ height). The clicking noise might be scary to your cat. Only battery powered, no backup power. The microchip has to be located directly on the back of the cat’s neck for the RFID sensor to scan the chip. The magnets make it a little bit laborious for your cats to shove the flap open. It does not work with 10-digit microchips beginning with 00, 010, 020. The mechanism requires the cat to stand still close to the door’s tunnel to get the chip scanned. To train your cat to get used to the “click” sound of the door unlocking, we recommend duct taping the “flap” open. So your cat can pass freely in the beginning. Even if your cats hear the “click,” they won’t be discouraged from pushing the door and going through it. It will get accustomed to that sound more easily. Some cats take to the door quickly and use it straight away without any issues. 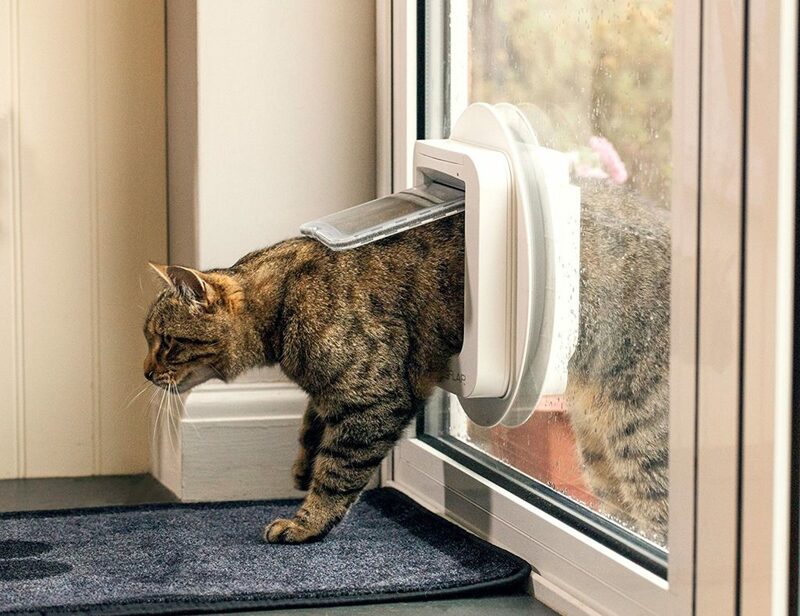 Other cats can take days to weeks to get used to it (and a real skittish cat may take a month), but in the end, cats always end up utilizing the SureFlap cat door. If you don’t want to get your cat microchipped, you can buy a chip and attach it to a cat´s collar. This way you can reuse the collar on other pets if you need to. You can buy new microchips if they get lost; they are rather affordable. If the scanner of the flap does not scan your cats’ microchip, the chip may have migrated down the neck. We advise you to see your vet if you suspect this is the case. 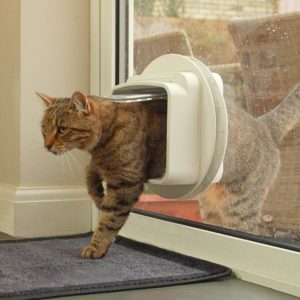 The SureFlap Microchip Cat Door is a remarkably great pet door that operates as advertised. The manufacturer improved the flap with the latest version. It is now much quieter when unfastening the lock. However, there is still a little clicking noise when unlocking; some cats might not like this at first. But it is not a loud sound, and with a little usage, your pets get accustomed to it fast. The instructions explicitly explain how to train your cat to use the automatic cat door. If your cat weighs less than 10 lbs, it will go through the flap without effort. Cats weighing over 10 pounds will probably have to do a little squeeze through the door to get inside your house. 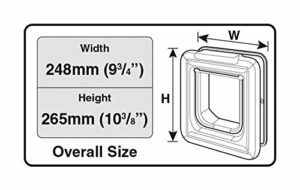 For large sized cats, weighing in at 11+ lbs, there is a special larger version which you can view here: the SureFlap Pet Door suitable for larger cats and small dogs. There are some previous editions of the SureFlap. The manufacturer guarantees that you will get the newest version when you purchase from Amazon.com. 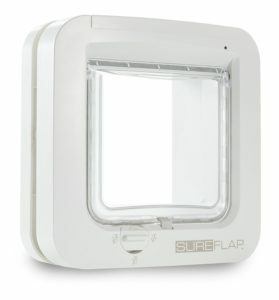 We recommend the SureFlap Microchip Cat Door to anyone who has a micro-chipped cat or who will microchip their pets. It helps greatly in keeping out the neighbor’s cat, or any other wild animals that may be intruding your home. This door is suitable for small to medium sized cats. To large breed cats, tall cats or overweight cats weighing more than 11 lbs; fat cats have to squeeze their body to go through.. or won’t fit through at all. If your cat has a 10-digit microchip that begins with 00, 010 or 020. If you require a 100% raccoon-proof solution. (The unit stops almost all raccoons, but a super tiny percentage of exceptionally bright raccoons may still outwit the SureFlap). Is your cat marking every corner of your house by spraying urine? The smell of stale cat pee is certainly not a pleasant one, and neither is the sight of seeing your cat spray urine on your new couch, curtains and/or walls. Territorial cats usually spray urine. The markings don’t make their habitat directly safer, but the cat can gather information through spraying. This helps the cat’s territory be safer. In this article you will discover why cats spray urine, and how to stop this natural, but unwanted, behavior. P.S. If you tried everything and still no success, we recommend you read this book. 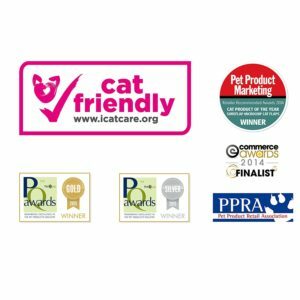 What is cat urine spraying? And why does it happen? It is important to first understand what this behavior is, and why cats do it, before you learn how to stop it. Marking territory with urine serves many purposes. It is a complex behavior, and out of scope of this article. We will outline for you the minimum you should know about feline urine spraying behavior. Urine markings are a form of communication. By spraying urine cats both send and gather information by smelling the markings of other cats around the area. Are urine marks like borders? No. Cats, and especially the males, usually have a large territory. Territories can overlap. There are no actual borders that need to be protected. Through cat markings with urine cats can become aware of other cats without actually ever meeting each other face-to-face. Insecure cats spray more. If a cat does not feel secure, she will spray more. The markings don’t make the area safer directly, but they help the cat gather information about other felines in and around their territory. Why do cats spray over other cats’ markings? A marking helps a cat to know if other cats visit there. A cat actually expects other cats to spray over his spraying marks. A cat does not spray to show dominance or to claim a territory. Why do cats keep spraying the same place? As long as the corner smells like urine, the cat wants to keep marking it to gather and send information to possible other cats. Cats do not spray urine for revenge. Sometimes, scolding your cat can lead to spraying behavior. The cat thinks this may actually improve your relationship. Other territorial markings of cats include clawing (in this article you can read more about cat clawing and how to stop it), and scenting objects with their cheeks and forehead. Cats spray for a multitude of reasons. The two primary reasons are to secure their territory and to find sexual partners. Helping a cat feeling more secure around his territory is a complex process. But lowering your cats sexual appetite is however an easy surgical procedure, carried out daily by vets all around the globe. The vast majority of cats will stop spraying immediately after neutering. 1 to 4 weeks after neutering. For the majority of people, neutering Mr. Mittens will be enough to stop him from spraying. If your cat keeps spraying after he has been neutered, keep on reading below. Your male cat will not stop spraying urine without neutering. Urine marking is natural behavior. Testosterone is the main cause of this. Testosterone is produced in the testicles. Sometimes cats don´t stop spraying immediately after being neutered. It is possible you only need to wait a little while longer, about 1 to 4 weeks. Or finding sexual partners was not the sole reason of your feline´s behavior We list a few common possible causes of urine marking by cats. Cats not getting along with each other is a common problem. A cat can be bullied by another cat. An unsettled hierarchy in the household can be a cause. The cat´s territory, or access to food and water is being threatened. Having more resources in the house usually helps. Add more litter boxes in multiple locations. More food and water bowls can work wonders too. Outdoor cats Common problems can be your cat going outside and spraying urine upon returning home. Your cat seeing other cats through a window, or smelling other cats´ urine marking through the wall. Sometimes this can be a cause of aggressiveness in cats.Keep other cats out of the yard. Clean the cat urine outside your house. Block the view that is causing the problems. Blinds or sticky films work well, or otherwise blockingthe window view. Spending more time interacting positively with your cat helps them to build confidence in their surroundings. Tensions with an owner. A common cause of urine spraying. The cat experiences a feeling of insecurity about his environment.Do not yell or punish your cat for his behavioral problems, including urine marking. Give the cat as much freedom as possible. Increase the amount of time interacting and building trust with your cat through playing, petting, talking, brushing and other positive activities. Adding climbing opportunities can also help. Stress in cats is the most common reason of spraying urine in neutered cats. We listed a few common causes of stressful situations, and how to remedy them. A new baby in the house, or a toddler starting to crawl or walk. It may be necessary to modify the environment. Create secure, elevated surfaces. Give your cat more attention, or make at least sure that it´s not getting less attention than before. Feeding your cat while the baby is nearby is a good way of getting accustomed for the cat. It´s important to teach toddlers how to interact in a positive way with cats, and how to pet cats the right way. New person in the household, or new frequent visitors. The cat and the person are not getting along. The cat can be afraid of the person. People can be too loud, or maybe they don´t like cats. Some people are afraid of cats. Get the other person involved in feeding, playing and petting. Not everyone knows cat behavior basics. Sometimes explaining cat behavior basics and signs of aggression and dislike to the person is the solution. Changes in the cat’s territory. Almost any change in the cat’s environment can cause stress. Some cats are more prone to stress than others. This can even be something as small as adding new furniture, or displacing coats and jackets. Moving houses often is a trigger of stress, especially if everything is new inside. To counter this, make changes slowly and gradually. Make sure you have enough playtime with your pet. Spraying furniture with pheromones can also do the trick, as does adding more climbing opportunities. Often a change in the cat’s feeding schedule is the culprit. If you need to make changes to your cats’ routine, try do so gradually. New pets or scents in the house, a new food brand or new sounds can also attribute to significantly higher stress-levels. Try to get your cat slowly accustomed by making these changes gradually, if possible. If not, make sure you give your cat plenty of playing time and positive attention. These are just a few causes of stress in cats. Other stress they may experience can also be a cause for urine spraying. Due to stress, the cat feels less confident and secure in his territory. By urine marking, the cat is trying to secure his territory. Often there are multiple causes that make a cat build up stress. Certain medical conditions can also be a cause for spraying behavior. Cats can have medical conditions that interfere with their hormonal balance. If the cat is in pain or experience’s discomfort, this can also lead to stress. Bring you pet to the vet as soon as you have the slightest hint of health problems, especially when you have done and tried everything to stop your cat from spraying urine, without success. Thoroughly clean urine from spraying locations. Cats re-spray their old marks. This helps them keep their markings updated. Other cats spray over markings of other cats. This helps the cats understand who is in their territory. If the cat smells that the spot has been previously marked, it will spray urine. Cleaning cat urine with everyday cleaning supplies is not enough to completely get rid of the cat urine smell. Even if it smells clean to you, your cat will still be able to smell the mark. A cat’s nose is far more sensitive than yours. When the cat smells the mark, the urge arises to spray there again. How to find cat urine? You usually find cat urine either by seeing your cat spray somewhere, or by smelling it. So you know where to clean, right? Unfortunately this is not the case. The scent of cat urine can linger for as long as a few months. You have to clean every single spot your cat has urine marked during this period. You can try and remember all spots that your cat uses to spray, or write them down. Even then it is still possible to miss spraying locations. Cats have a much more sensitive nose than you. It is easy to miss a spot. A simple black-light LED flashlight is your solution. Certain substances light up under black light, including cat urine. You can usually buy these flashlights in hardware stores, but it’s often cheaper, easier and quicker to do so online. If you shine your black light over area’s where cats have sprayed, a grayish/yellowish glow will appear. This is the area that you need to clean very thoroughly with a specialized cat urine remover. 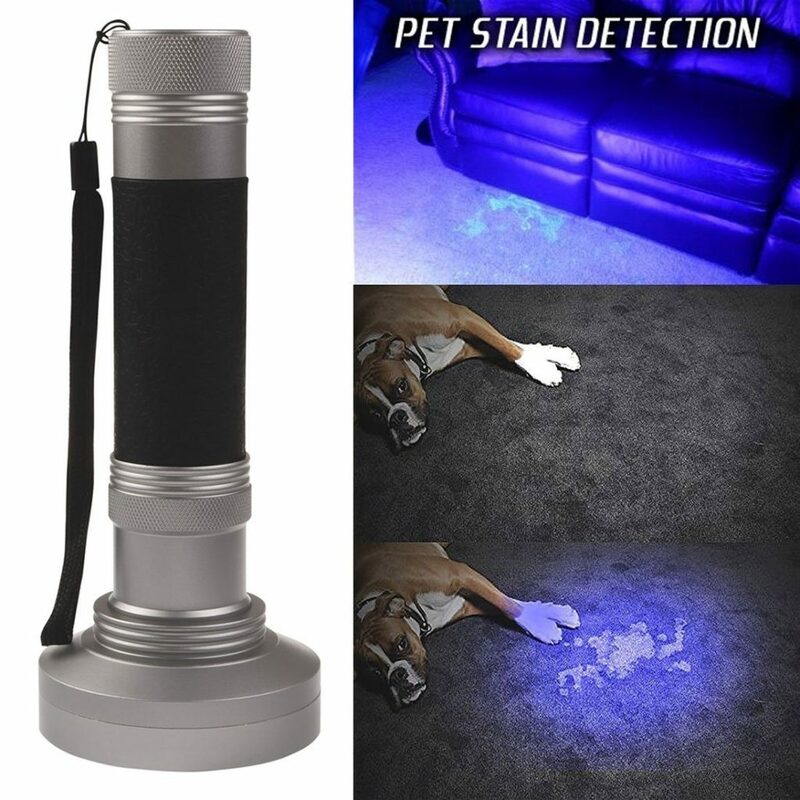 As you can see, without a UV black-light it is very, very difficult to get rid of all the urine stains your cat (or dog) has made around the house. We recommended investing in a good quality UV light, like this one, if you need to thoroughly clean pet urine. How to clean cat urine? Use a specialized cleaning detergent that is specifically made for removing cat urine. These cleaning supplies do not mask the smell, but bind to the molecules that cause it. This completely eliminates cat urine and consequently, the smell. Specialized cleaning supplies can be bought at pet stores, some hardware stores and online here. Most cleaning detergents for cat urine are quick and easy to use, with a simple “spray on and let dry” mechanism. Some require a bit more instruction, so always check the label before use. Giving a new purpose to the location that is being marked with urine is the next step in the process of stopping cats from spraying. In their natural habitat, cats do not spray certain locations. E.g. Cats do not spray areas where they sleep or hunt. There are several ways to make these changes in your household, we’ll list a few. If you already tried below options without (lasting) success, we advise you to read this book. Place a water bowl in the vicinity of the markings. Cats to dot spray urine where they drink. Spray the location with cat pheromones. Pheromones are scents that cats leave behind by rubbing against objects. You can buy these pheromones in a spray solution. If the cat gets the scent that a location has been marked by rubbing, it will registered this location as “marked” and therefore not spray it. Place a scratching post near the markings. Cats not only scratch to keep their claws in good shape. Scratching serves a few purposes. By scratching, cats leave behind scents from their paws. Scratching marks are also a visually indicator of the presences of felines. If the cat scratches near the place where urine spraying occurred, the cat will no longer need to urinate there. Territorial urges have already been met. Play with your cat near the urine marking location. Playing and hunting are essentially equal to cats. Cats do not spray urine where they hunt, as this would alert their prey. We can simulate this behavior by playing with your cat with an interactive toy for 10 to 15 minutes around the spot. Have a few of these sessions daily. It takes about a week to see a noticeable improvement. Don’t forget to play regularly with you cat after that! Feed your cat near the spraying location. This behavior is related to hunting. If you provide food at set times and places, make the spraying location a feeding place instead. If you free feed your cat , leave some food at the spot that used to be sprayed. Place your cat’s bed near the spraying location. Sometimes placing a cardboard box for napping is enough. A cat’s sleeping spot must be a safe and secure place. A cat would not spray around there, because he does not want other cats to be alerted of his whereabouts. Important: While you are helping your cat to stop spraying his old location, your cat start making new ones somewhere else. This is often caused by the cat not feeling secure in his habitat. Distract your cat before spraying occurs. When you notice your cat is going to spray urine on your wall, you might want to stop that from happening. Distract the cat by refocusing his attention in a positive manner. First, make sure your cat responds. Keep calling and pet him, of give him a treat if he responds well. You can also pet your cat, to associate not spraying with positive attention.. If you want to get a cats attention, a sure way is to rattle or open a pack of their favorite treats. Food is more interesting than spraying. Dingle a thread or throw a toy in your feline’s direction. If it contains catnip, that’s often even more effective. Keep playing for a couple of minutes with your pet afterwards. Clicker training is a good way of training and correcting behavior. It’s easier because you don’t need to have a toys or treats near you at all times. In these cases, clicker training is a very handy tool. Note: It is important that you apply above tips and tricks only if you get your cat’s attention before the urine spraying. If you apply these tips after the spraying, you will only reinforce the spraying behavior by rewarding your cat with positive attention. Do not punish your cat after spraying urine. It’s not fun when your cat marks your couch with urine. But punishing your cat will only make him spray more. Neutered cats most often spray because of stress. Punishing your cat either through physical punishment or by yelling will not stop you cat from spraying urine, but will only increase the behavior. Cats that are neutered commonly spray due to stress. Punishment increases stress greatly. It is best to ignore your cat completely when he marks. Ignore the bad behavior, and reward the good. Clean up after your cat with the methods described above. Don’t pay any attention to your cat while cleaning. Don’t call him, lecturing him, or give any attention in any way. Clean the area and next time prevent your cat from spraying, before it happens. Provide a safe, secure and calm living area for your cat. The gist of this article is that cats most commonly spray urine because of stress, if hormonal factors are out of the question. It is the best interest in both of you to get rid or minimize stress.. If you manage to reduce stress, your cat will not spray urine any more. If you still have problems with your cat’s spraying behavior, invest in this book. 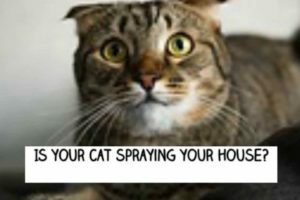 It has more detailed information on cat spraying and how to stop it. During the process of domestication, indoor members of feline family gradually accepted rules that humans imposed to them. Including litter boxes. Because of that, owning a cat requires much less of your time and attention than owning a dog. You don’t have to take your kitty out whenever she needs to relieve. But, there are some other tasks related to cat ownership. Litter box cleaning for example. You will have to scoop daily, or even twice a day. If you have more than one cat, scooping work will multiply, too. Besides, dirty litter is full of bacteria that can easily transfer into the human body. This can be especially harmful to people with impaired immunity and pregnant women. 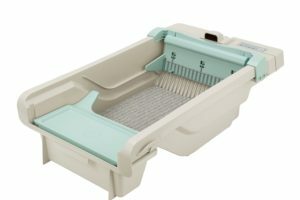 If you use an automatic litter box like the Arm & Hammer Quiet No Odor Litter Box (see on Amazon), it will separate the waste into the closed compartment, so you won’t have to put your fingers around cat feces. The odor will be minimized, and your kitty will always have a fresh “toilet”. The Arm & Hammer Quiet No Odor Litter Box was created to help cat owners with keeping the cat box tidy. This electronic litter box works well in single cat and multiple cat households. The product is really simple to assemble and comes with instructions provided. There is a step-by-step YouTube video which can be helpful. Everything can be put together on-click, so you won’t need to use any tools. While assembling the Arm & Hammer Quiet No Odor Litter Box, you will notice that it has 2-in-1 Odor Elimination system. The first line of defense is the liner placed in the waste compartment. It will absorb bad smells and keep them locked in. For an extra odor elimination, there is a baking soda filter. This filter neutralizes everything that goes through the liner. With double odor protection, your house will always smell good. You won’t need to spend your money on additional air refreshers. It is very important to fill the tray with the right amount of litter. You should pour somewhere between two min/max lines on the sides. The brand of the litter used is not significant, as long as it can form hard clumps. When the kitty relieves, the clumped urine and feces will be picked up with a movable rake and sent into the waste receptacle. This is a simple but effective way to separate the refuse from the clean litter. When programming the unit, you can set it to be active every 1, 4 or 8 hours. The frequency of cleaning should be higher if you have more cats. Some cat owners prefer automatic litter boxes that activate after every use, but you can always run additional cleaning cycle manually. Although Arm & Hammer Quiet No Odor Litter Box is already less noisy than similar products, sleep mode will keep the unit completely inactive during the night. Also, there are infra-red motion sensors that will stop the rake from moving backward if the kitty reenters while cleaning. This is very important for your pet’s safety. Maintenance of this product is simple since the motor can be detached with a click. This means that you can wash it with soap and water when you remove the motor. You won’t have to fear that you will damage sensitive electronic parts. The rake is also removable because it might need more frequent washing. Arm & Hammer Quiet No Odor Litter Box is assembled on-click. No tools are needed. You can use any brand of hard clumping litter. Can be used in multiple cat households. Special waste receptacle liner that absorbs the bad smell. Baking soda filters for additional odor elimination. The filters are safe for the environment. Odor filter should be changed monthly if you have one cat. The cleaning cycle activates on timer. It can be set to sweep hourly, or it can be programmed to rake every 4 or 8 hours. The cleaning cycle can also be started manually. Light indicators, so you know how the timer is set. Infra-red motion sensors for safety. They will stop the rake if the cat enters. You won’t have to get in contact with bacteria from the dirty litter. You can change the waste liner without touching the poop. If you have more than one cat, you can use Arm & Hammer Quiet No Odor Litter Box. Just program the timer to more frequent cleaning. Saves you money because it doesn’t require expensive litter brands. It is only important that the litter forms hard clumps so they won’t scatter. Fixed timer settings. The cleaning cycle is not triggered by the cat. The Arm & Hammer Quiet No Odor Litter Box is an automatic cat box that is easy to assemble and to maintain. It has numerous great features like the waste liner, baking soda odor filter, detachable motor, safety infra-red sensors, just to name a few. 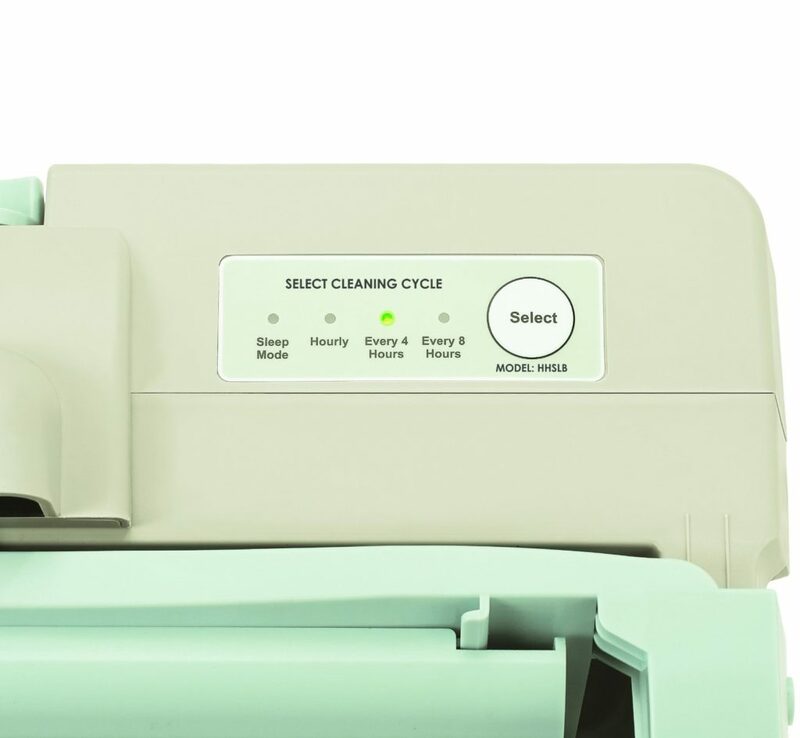 When you program the unit, you can set it to clean every 1, 4 or 8 hours. You can also initiate the cleaning cycle manually or set it to the sleep mode during the night. om getting out. It also has additional baking soda odor filter that is safe for the environment. The unit has a beautiful design, and it can fit in any décor. Replacing the waste liner is hygienic, and it won’t require you to touch the waste. The Arm & Hammer Quiet No Odor Litter Box is not noisy for and automatic cat box so it won’t traumatize the kitty. It can be used in single cat or multiple cat households. If you don’t want to get in contact with harmful bacteria every day when you scoop manually, you should consider getting this kind of product. If you own a cat for quite some time you are probably sick and tired of scooping by now. Once or twice a day, you have to mess with the dirty litter. Putting your face near this smelly area while the litter dust flies around is certainly not how you imagined cat ownership. And it is also not good for your health. But, in order to keep your kitty happy you just have to do that. I mean HAD. 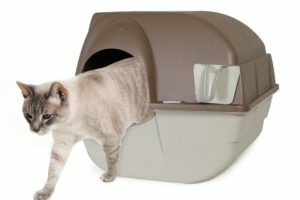 Now there is a revolutionary Omega Paw Large Self Cleaning Litter Box on the market. This product will solve all your scooping problems. You will not have to breathe in the litter dust while cleaning your kitty’s “potty” ever again. Instead, all you will have to do is roll the unit and empty the pullout scoop. Who would have thought that cleaning the dirty litter box could be so easy? 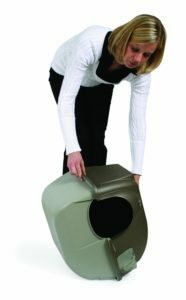 Omega Paw Large Self Cleaning Litter Box uses interior grill system to separate the waste from the clean litter. After you assemble the unit, fill it with about two inches of cat litter. You can use either hard clumping litter or silica litter. Stick to the one that your kitty used before to make the transition to the new box more acceptable for her. Some kitties are very fussy when it comes to their “toilet” habits. 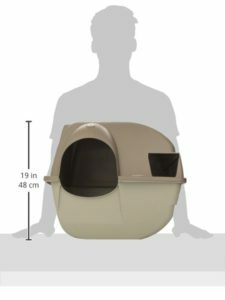 Since the Omega Paw Large Self Cleaning Litter Box has an enclosed design, it will give enough privacy even to the shyest cats. It can be used in single or multiple cat households. The lid will prevent the litter dust and granules from flying around while your kitty digs. This is especially useful for felines that really like to pile the litter. If you want to prevent the litter mess completely, you can buy a paw cleaning mat and place it in front of the exit. Since this hole is the only way for your pet to get out, she will have to step on this mat. Assembling Omega Paw Large Self Cleaning Litter Box is very simple, and even a little girl can do it. It doesn’t require any tools or physical strength. When you put the lid on top, all clips will have to line up correctly. Otherwise, the product won’t work properly. Also, whenever you need to change the entire litter or clean the unit, you should remove the top part. Here is how the interior grill system works. When the kitty relieves, it will take a minute or two for clumps to form, depending on which brand of litter you use. After that, you can start with manual self-cleaning. Roll over the box to the right, toward the side where the pullout scoop is placed. When you lean the box to this side, the entire amount of litter will go through the grill except the waste. The refuse will stay on top. Hit the bottom of the box gently to be sure that no waste sticks to it. Then return the box to its normal position. During the rollover, all of the refuse will fall into the removable scoop. All you will have to do now is to pull it out by the handle and throw the refuse away. …. and scoop it out. 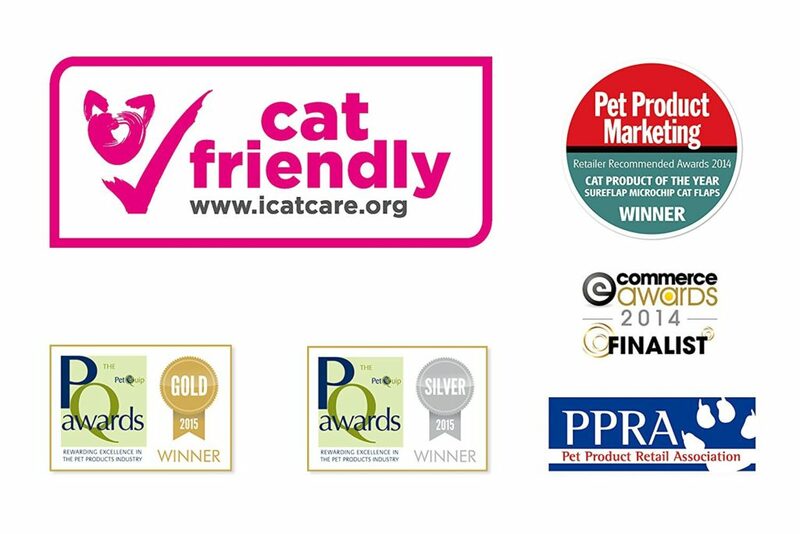 Cat owners love this product because it is very simple and it has an acceptable price. There is no motor that can break down, so the unit is very durable. Also, no motor means no noise that can scare off your cat and disturb your sleep. You can place this cat box anywhere in the house since there are no cords or adapters connected to the unit. The best thing is that there are no hidden costs associated with Omega Paw Large Self Cleaning Litter Box. You won’t have to buy spare cartridges, waste receptacles or liners, which are required for most automatic litter boxes. It won’t even increase your electric bill! However, there are a few things that you should keep in mind when buying this product. It is a self-cleaning litter box, but you will have to roll it over manually. This means that you will have to do some work every day in order to keep it clean. But, you won’t have to inhale litter dust or put your fingers near the waste. It is much easier and hygienic to roll over the unit than to scoop manually. If your kitty has to wear e-collar, she won’t be able to use the unit with the top part on. You will have to detach the lid every time she needs to go. Another solution would be to keep the cover off, and put it back only for the cleaning. Luckily, cones are temporary, so it will be just a small sacrifice that you will have to make for your pet’s health. 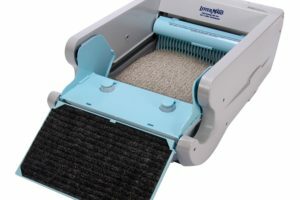 Omega Paw Large Self Cleaning Litter Box self-cleans when you roll it manually. Works with any premium clumping litter brand. Also, you can use silica litter. No tools required for assembling. No cords or AC adapters. No batteries required. 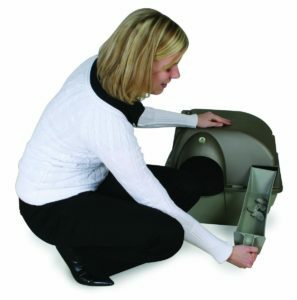 Omega Paw Large Self Cleaning Litter Box has a one-year manufacturer warranty. The price is affordable when compared with electric litter boxes. It costs as low as regular litter box. No costly cartridges, waste receptacle replacements or liners. Saves money on the clean litter. 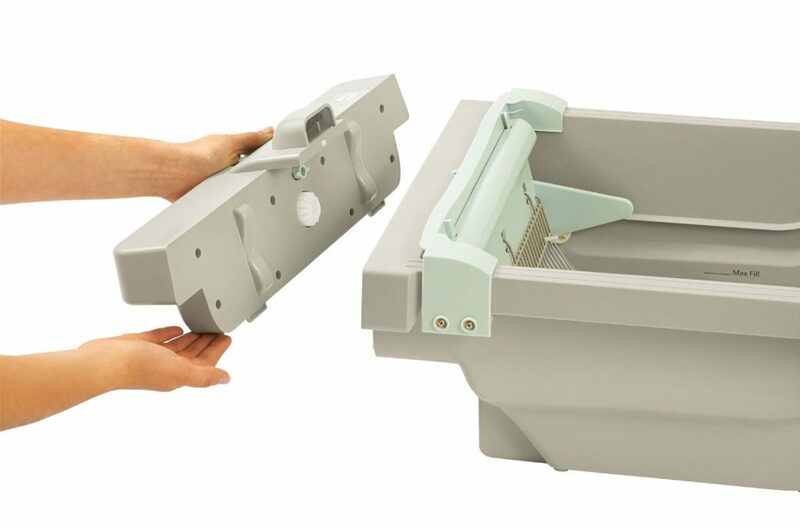 Omega Paw Large Self Cleaning Litter Box can be assembled in a few simple steps. Shy cats will appreciate the privacy. Short and simple cleaning process. Doesn’t make any noise, since there is no motor in the unit. The hood will prevent litter granules from getting out of the tray. No dust will be flying around while the kitty digs. The lid can be removed easily for occasional thorough cleaning and litter replacement. Can be placed anywhere in the apartment since it doesn’t need to be near the socket. You will have to roll the unit manually. No odor filters built-in. You will have to wash the unit from time to time to prevent bed smells. 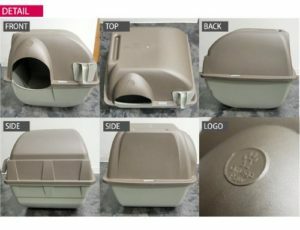 If you are looking for the best balance between the price and the quality when buying a self cleaning litter box, Omega Paw Large Self Cleaning Litter Box (get it here) might be the right product for you. 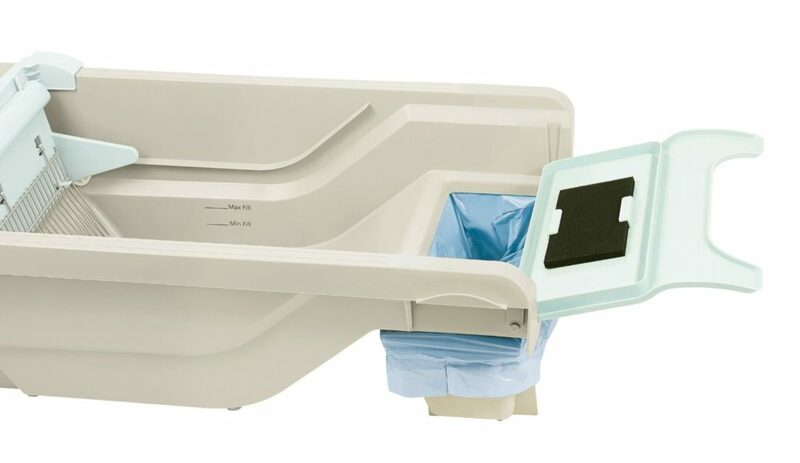 It has interior grill system that will separate the waste into the pullout scoop whenever you roll over the unit. Then you just empty the scoop without the need to touch the refuse. You won’t get in contact with harmful bacteria or inhale litter dust. The enclosed design will prevent litter mess and keep your house tidy like you don’t have a cat at all. This product works with any premium clumping or silica litter. Even if you have more than one cat, Omega Paw Large Self Cleaning Litter Box is suitable for your household. You will just have to clean it more often. This cat box is not noisy, and even the shyest kitties feel comfortable using it. There are a few things that every responsible cat owner has to do to keep their feline beauty happy and healthy. Cleaning their litter box is certainly one of them. Kitties really hate dirty litter boxes! So, if you own a cat, you should find an easy and reliable way to make sure that she always has a clean place to go. Even when you are away, sick or sleepy. Always. Automatic litter boxes can be a great solution for this issue. For example, if you invest in the Littermaid LM680C, it will start the cleaning cycle every time the kitty leaves the unit. Waste will be separated to a special sealed receptacle, so you won’t have to worry about dirty litter or bad smells caused by feces. Instead, you will know that the automatic cat litter box took care of everything. This product is perfect for cat owners that travel a lot or work extra hours. It is also helpful for pregnant women or physically challenged people. But don’t worry, you don’t have to fall into any of these categories to experience benefits of this self cleaning litter box. Lazy cat owners love it, too. The Littermaid LM680C is designed to suit perfectly to cats up to 15 pounds. The unit is not bulky, so it is the best to be used in single cat households. When you assemble the product place it somewhere near the power socket, since it works on electric current. Fill it up with any premium fast clumping litter. Be careful not to pour above the maximum litter line marked on the sides. If you overfill the tray, the rake might jam during the cleaning cycle. After the feline gets out of the unit, she will activate motion sensors which will cause the timer countdown. The timer is set for 10 minutes so hard clumps can be formed. After that amount of time, the rake will start moving and separating clumped waste from the clean litter. When it reaches the other side of the tray, the rake will put the refuse into the waste receptacle. Now the box is ready to be used again. To make sure that there is no odor in your house, the Littermaid LM680C has a carbon filter built-in in the waste compartment. It will neutralize the bad smells and prevent them from getting out. Also, litter mess can be quite an issue since cats often carry granules through the house on their paws. That is why a carpeted ramp was added to this model. While leaving the unit, your kitty will wipe her paws off this mat. The LM680C has a beautiful and practical design. It comes in a neutral combination of light gray and light blue so it will beautifully fit into any apartment. It is not bulky, but it has high side walls that will prevent litter mess. Cats are well-known diggers, but these walls will keep the granules from flying around. Now you might be wondering will your cat accept this gadget. Well, since it looks like a regular litter box, the kitty should be adjusted to her new “potty” in no time. However, some kitties are very fussy so patience might be required. Maintenance of the Littermaid LM680C is really simple. Once in every 5-7 days, you will need to change the waste receptacle. Also, you will need to replace the entire litter from time to time. If necessary, the plastic rake can be removed from the unit and washed separately. This automatic cat box comes with A/C adapter, carpeted ramp, 8 spare carbon filters and 8 spare waste receptacles that are all included in the price. It works on electrical power, but there is a backup battery option in case of an outage. Don’t fill the tray above the max litter line. It will stop the cleaning cycle because the rake is not designed to go through that amount of litter. Use fast clumping litter. The clumps should be formed in about 10 minutes. Use hard clumping litter. If the clumps are not hard enough, they might shatter. Use a premium quality litter that won’t stick to the rake. If the rake becomes dirty, just detach it from the unit and clean it with soap and water. 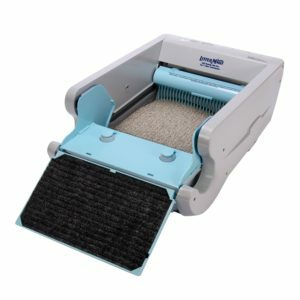 Littermaid LM680C will make your cat ownership easier because you won’t have that much work around your kitty’s box. However, minimal work is required once in a while, like changing the waste receptacle and filling the box with a new, clean litter. But, all the scooping is done automatically. So, basically, you can forget about the dirty work for 5-7 days, until it is time to change the receptacle. he Littermaid LM680C has a limited one year warranty for US and Canada customers. Also, there is a free 800 number available for any type of assistance and service related to this purchase. Rake is very easy to clean. It can be removed from the unit and washed separately. Your cat will love to use it because it resembles regular litter boxes. If you put too much litter inside, the rake might jam. Just fill it up to the maximum litter line. Not suitable for cats heavier than 15 pounds. Not suitable for multiple cats households. Every responsible cat owner should make sure that his kitty has a clean and fresh place to relieve 24/7. But, nobody can sit at home day and night, waiting for his furry friend to do her business. 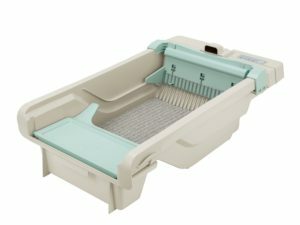 That is why you should get a high-quality automatic litter box, like the Littermaid LM680C for example. Whenever the kitty goes, she will trigger motion sensors. They will activate the timer. The cleaning cycle will start 10 minutes after the cat leaves the tray. Rake will sweep through the litter, separating the clumps into the waste receptacle. The waste will be sealed, so bad smells will be able to get out. For additional odor control, there is a carbon filter on the lid of the waste drawer. The good thing about Littermaid LM680C is that it works with any type of premium fast clumping litter. It also has high walls and paw cleaning ramp to prevent the granules from getting to the floor. This automatic cat box can’t be stopped even with a power outage, because it has the backup battery option.